4K resolution with 60 Hz refresh rate? 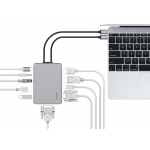 Extend to two 4K displays from your MacBook Pro? Use fast Gigabit Ethernet? Charge your iPad while working? 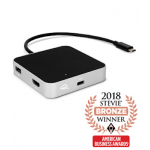 It's all combined in this sleek USB-C Compact Dock with its 8 ports and massive bandwidth like no other dock in its class. Ideal for the integration in the most powerful 4K workflow at highest refresh rate (Mini-DP 4K@60 Hz and HDMI 4K@30 Hz)! Apple LED Cinema Display (24-inch & 27-inch) and Cinema Display (30-inch DVI Late 2005 - in combination with MB571) are supported. 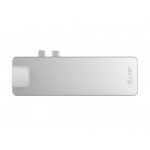 Apple Thunderbolt Display (27-inch) is not supported.